it’s food day here in sunny Burbank California for 5-in-5, with a modified Salazar: the peacemaker. A Salazar is a historically fantastic, gorgeous, and satisfying sandwich. It was created 2 years ago at mawopi HQ with Mehmet and Charles, in a desperate moment of severe hunger as a testament to collaborative cooking and fortifying friendship. 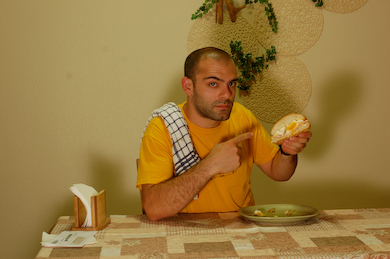 A Salazar consists of a a huge turkish bun with some sour cherry spread, a fried egg lying on top of moist roast beef, and armenian string cheese. Delicious, hits all the major food groups, and includes enough tartness to get ya going real good. Our project today was not a Salazar. This is definitely not the Salazar. I mean, there’s no roast beef. This is a modified Salazar. See, the way it works is that any sandwich that isn’t a Salazar but is made in the original spirit and with some of the original ingredients, is a modified Salazar. Some are good, some are not. Failures are generally named after shamed latin american dictators, such as the Pinochet, a rather disgusting sandwich with turkish kefte and pita bread. This is the peacemaker, a sandwich created to resolve conflict. Don’t believe me? 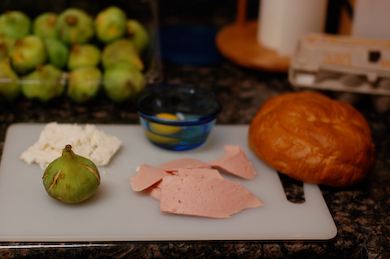 try a fresh august fig with a piece of feta cheese. If you have any fight, argument, or pride left in you afterward I’ll be surprised. 1 ripe august fig, on the large side. the green skins, not the purple/black ones. Start with poaching the egg. I use the easy method of bringing water to boil, adding a teaspoon of white vinegar, turning off the flame, and laying the egg into the water gently from a saucer. I like the yolk in between runny and solid, which means that I leave it in for about 3 minutes. Adjust accordingly. I keep a bowl of ice water next to the pan to use as the first drop off point of the egg. Usually this is done when you have to make more than one poached egg, but I find it also tightens up the white and washes off any odor of vinegar. After this, it’s all smooth sailing. Since I prefer the bread soft, but I like the inside toasted, I put the broiler on high and the buns facing up right under the flame for 2 minutes, just to get a light brown. lightly butter to make sure the bun has some give under it, and pile on the meat. I used veal bologna because I was looking for two things: even texture and no pork. A true Salazar and a true peacemaker both don’t use pork. lay on top of the meat the egg, then the figs and the cheese and you’re done. Now remember, the peacemaker is consumed ideally in the sun with a lager, old friends, in the Mediterranean sea of your mind, and only the best intentions guiding your discussions. The summer of Salazar, chives, peaches, yogurt and roast beef, lightly drizzled with honey stuffed into a pita bread. The recursive Salazar,aged parmigiano reggiano, sliced sweet sopressata, thinly sliced peaches, sour cherry jam, fresh mint garnish on a raisin challah bread. the Vegetarian Salazar Original ingredients minus the meat. simple, yet so elegant. If there is ever sandwich warfare, it will be considered a war crime to make this sandwich in competition, as it immediately wins, and destroys all other sandwiches in the vicinity. Also, If you photoshopped anything else into that picture of you holding the sandwich, in the sandwich’s place, I’d still be sold. It’s so convincing. You had me at “fig”. © NYU ITP 4-in-4 » The peacemaker: a modified Salazar 2010, All Rights Reserved.